This uplifting story of a boys' football team shines light on the under-appreciated virtues that can bloom in impoverished neighborhoods, even as nearby communities exclude them from economic progress. Never Ran, Never Will tells the story of the working-class, mostly black neighborhood of Brownsville, Brooklyn; its proud youth football team, the Mo Better Jaguars; and the young boys who are often at the center of both. Oomz, Gio, Hart, and their charismatic, vulnerable friends, come together on a dusty football field. All around them their community is threatened by violence, poverty, and the specter of losing their homes to gentrification. Their passionate, unpaid coaches teach hard lessons about surviving American life with little help from the outside world, cultivating in their players the perseverance and courage to make it. Football isn't everybody's ideal way to find the American dream, but for some kids it's the surest road there is. The Mo Better Jaguars team offers a refuge from the gang feuding that consumes much of the streets and a ticket to a better future in a country where football talent remains an exceptionally valuable commodity. If the team can make the regional championships, prestigious high schools and colleges might open their doors to the players. Never Ran, Never Will is a complex, humane story that reveals the changing world of an American inner city and a group of unforgettable boys in the middle of it all. Albert Samaha is a criminal justice reporter at BuzzFeed News. He has written for the Village Voice, San Francisco Weekly, and the Riverfront Times, and his work has appeared in the San Francisco Examiner, the New York Observer, Pop-Up Magazine, and the Best American Travel Writing anthology series. His stories have won awards from the National Association of Black Journalists, the National Education Writers Association, the California Newspaper Publishers Association, and others. He is a graduate of Columbia's Graduate School of Journalism and lives in New York City. "Refreshing and raw, Never Ran, Never Will tracks the boys of Brownsville, Brooklyn as they age out of innocence and details the efforts of the devoted men and women laboring to guide them into adulthood. By the last page of Albert Samaha's compelling debut, you don't just want the boys of the Mo Better Jaguars to make it - you realize that we all need them to." 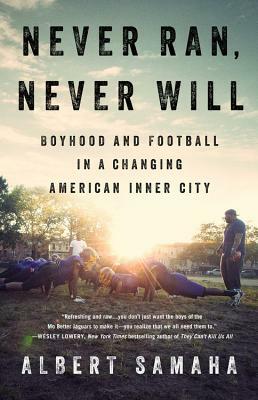 "Never Ran, Never Will is the irresistible story of the Mo Better Jaguars, a football team of hard-luck boys in low-income Brownsville, Brooklyn. With dazzling prose, Albert Samaha's big beautiful book about teamwork and ambition, growing up and breaking away, will touch you with its heart and grace." "Good narrative nonfiction requires a kind of alchemy-thorough reporting and incisive writing are essential, but the most important ingredient is time. Albert Samaha's years-long commitment to this tale of striving Brooklyn kids and their dedicated football coaches shines through on every page. The result is a rare gift: a story with genuine characters, real texture, and deep, sensitive insight."